Tag Archives for " Clementina Esposito "
If your child, young pet or garden wasn’t growing…what would you do? Consult a pediatrician, veterinarian or expert gardener? The alphabetized list makes the choices seem obvious. You’d go with C & D and, yet, many business owners often choose A & B hoping for a miracle. In a public corporation, growth reflects and depends on the knowledge, skills and abilities of others. But growth in your business is 100% under your control. It reflects, to a large degree, the decisions you make and actions you take to generate growth. 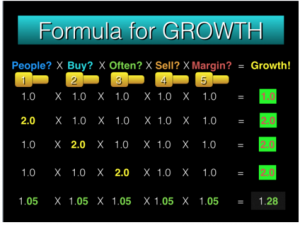 Working with small business owners has taught us that growth is a fairly predictable outcome assuming you utilize six (6) keys that foster it. 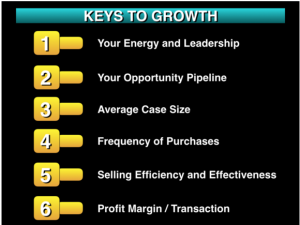 If, however, you choose to ignore these 6 keys stagnation and decline are likely results. Your business is alive with the energy you feed it. Growth reflects that you’re feeding yourself and your business well. When your business is easy for clients to consume, and they like it, they want more. Therefore, you need to be well fed and growing to feed your clients well too! If you’re seeing shrinking customers, profit margins, inspiration and support… take care of yourself first. And take it from there. Failure to thrive in your business may be the first and best indicator that you’re failing to thrive personally. New York Times bestselling author Michael Port—if you haven’t read Book Yourself Solid or Steal the Show, move them to the top of your list —teaches that business problems and personal problems are interchangeable. Ditching the dichotomy between what’s going on in your personal and professional life may be the fastest way for you to accelerate growth in both areas. After learning what he was already doing to do that, he discovered his greatest opportunity for growth would come by focusing on 1 of the 6 keys mentioned above. To achieve truly significant growth in his business, he focused on growing revenues from each service he offered. This made sense because he had a decent number of returning customers who were loyal to his business. His customers drive, on average,15,000 miles / year. He changes their oil every 5,000 miles. He charges $35 for an oil change. He performed, on average, 3 oil changes per customer per year. Oil changes alone generated $105 from each customer (3 X $35 = $105). We suggested he advise his customers to change their oil every 3,000 miles rather than every 5,000 miles – a practice that is trending in popularity. As a result, his customers are changing their oil, on average, not 3 but 5 times a year (15,000 miles / 3,000 miles = 5 oil changes). Finding a way to increase his customers purchase frequency produced a significant growth – 67% — in revenue for this one line item alone. Significant improvement in any one area in your business that’s failing to thrive will generate significant growth. All of our hands went up. Again, all of our hands went up. “How many of you believe that learning new ideas will, alone, generate more revenues? That instructor taught 2 important lessons. First, there is a direct correlation between the prospects you’re seeing and the revenue you’re generating. Second, to increase revenues, you need to see more people, see ‘better’ people (those that buy more from you). The instructor also said, ”If all you learn today is how to see TWICE as many people in the future as you are now, you’ll be making TWICE as much money!”. Technically that’s true but unlikely. It’s easier said than done. A more realistic path to growth comes from consistent improvement in each of the 6 keys to growth cited above. If you intend to grow your business in 2016, commit to leveraging each of the 6 keys cited above and develop a plan to use them to unlock your business growth potential. Remember –– modest changes, applied consistently and conscientiously, produce a synergy that will help you grow your business substantially in 2016. Growth of you, personally and your business, financially is necessary for the benefit of both. Factors that drive revenues and profit are readily known and 100% under your control. Focused, conscientious action can improve any or all of the growth factors cited above. 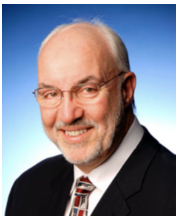 Bill Doerr is a connector who loves to connect clients with good people, great ideas and superb services. He collaborates with other providers in ‘projectships’ that combine “the best of many for the benefit of all”. His firm, SellMore Marketing, LLC, specializes in helping financial advisors build their referrals and revenues so they can afford the lifestyle of their choice. In college, Bill walked wolves (it’s a long story) and is an instrument-rated, private pilot – a capability he’s actually used on several occasions (apparently successfully, too!). He is a certified Duct Tape Marketing consultant and the author of Marketing Insights – a one page, bi-weekly client letter popular with professionals seeking to market their expertise without selling their souls.